Sold by iGadgitz and Fulfilled by Amazon. Gift-wrap available. 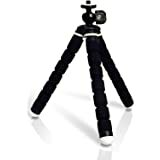 iGadgitz large mini tripod with 1/4 inch screw thread with quick release plate for Digital Compact or DSLR Cameras. Only 26cm in height. Can support maximum weight of 880g. Perfect for both amateur and professional photographers. Sold by iGadgitz and sent from Amazon Fulfillment. 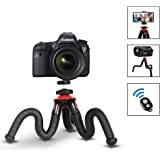 Flexible Camera Tripod for DSLRs and Compact System Cameras. 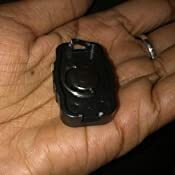 Quick Release Plate. 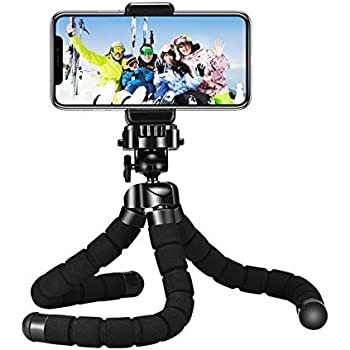 Compatible with Gorillapod. 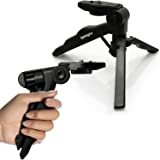 The iGadgitz large flexible mini tripod lets you position your camera almost anywhere to help you capture the perfect shot. 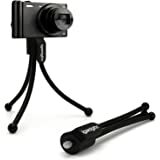 Completely flexible and versatile, it simply & securely fastens to your camera in seconds. Rubber feet grips provide enhanced stability on uneven surfaces. The tripod fits easily in your camera bag without adding noticeable weight - it weighs just 158g with height of 26cm only! 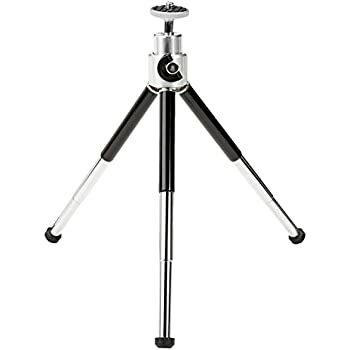 Whether you're taking a shot of you and your friends whilst camping or lining up the next landscape whilst walking, you'll be happy you have this handy little tripod close at hand. Does the job! 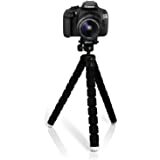 I use this with my Nikon D3200 DSLR and it's worked like a dream. It's definitely been strong enough to hold my camera in numerous situations and I've never been worried about it falling over or damaging my camera. It's so handy to pop in my bag when I'm off out on an adventure, and so easy to attach to my camera! I love it! So glad I didn't shell out for the Gorilla products instead! WARNING The bracket which screws on the underside of your camera is then connected to the tripod by pressing two buttons. But the plastic surrounding the clips is so thin it was bound to snap off sooner or later. Mine lasted about 3 months. After it has snapped the product is useless. 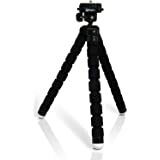 So far this little tripod has performed well in supporting my Sony RX100m3 with its case bottom and Lensmate filters. I have bent the legs tightly around a pair of steps and it didn't move and the legs straightened after with ease, so does the job and takes the weight well. I would recommend this for your kit bag as it's light & strong. I didn't give it 5* due to the limited amount of time I've had it. Really flexible tripod that can be attached to almost anything! 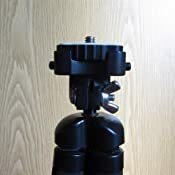 We have taken it for walks and attached it to our daughter's pushchair for family shots, lampposts, trees, fences, anything where you can get a curl into the flexible legs so that it keeps the camera in place. I have a Sony A6000, so it is a lot lighter than DSLRs, but the rotating head feels very secure and I am sure it would take the weight of that heavier family of cameras. 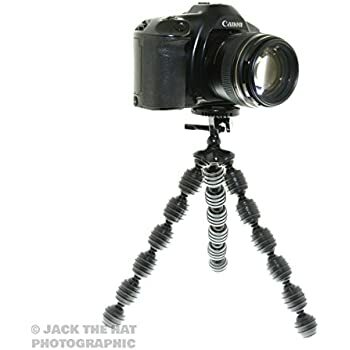 If you want to take static shots in our of the way places then this is really an invaluable tool. received the item very quickly. 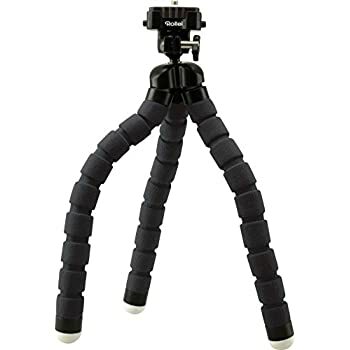 The legs have good flexibility and the foam covering provide good enough friction. However head ball and quick release system is small and flimsy. The quick release works by pressing one or two buttons on the side of the platform. This is easily caught when trying to adjust the ball head screw releasing the camera unexpectedly. The platform itself is fairly small. 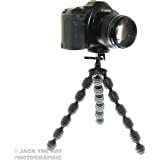 In my opinion this good enough for small point and shoot cameras but not suitable for dslr's, even lighter ones. I returned mine. 2.0 out of 5 starsBroke within a week of use! At arrival I was very pleased with the quality of this product. I have used it on a couple of shots. 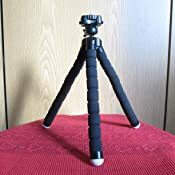 However a week later, when I was using it for perhaps the 3rd or 4th time, I went to set up the "flexible" tripod when suddenly one of the legs had completely broken off. I looked closer to discover that the actual metal pole within had snapped. I was very disappointed as I had only used to tripod on very very simple shots and angles. Please can i get sent a new one? 5.0 out of 5 starsGreat all rounder. 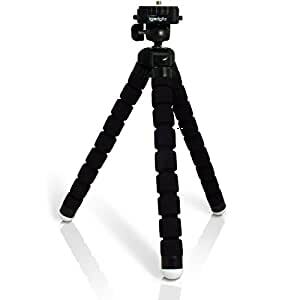 Bought just to go in my camera bag but so useful it goes with me everywhere just in case. 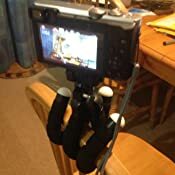 I've got a holder for my iPhone that fits this so can now use it from my iPhone through compact, bridge camera, and system camera. 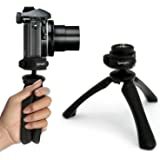 It's putting my other tripods to shame.